Has fun changed since my glory days of Halloween? Happy Halloween everyone! I went out tonight with the kids, and stormed around the streets. They were so much fun to watch. Life time memories. I couldn’t contain their spirits. They were a buzz. I have never seen them run so much, with such enthusiasm. If only they showed the same determination for chores around the house. ha ha. You tell your kids, ‘make sure to say thank you!’. Don’t run, or you may get hit by a car. Don’t let your kids touch or play with fireworks. Wear bright reflective vests/bracelets/lights to be seen. Keep them in your sight so they aren’t snatched away. Feel kind of creeped out when some nicely dressed witch lady asks to take a picture of your kid because she loves his costume. Where are all the homemade treats? 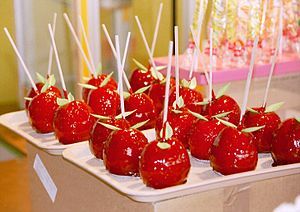 Candy apples, popcorn, homemade taffy. You can’t trust what people who live practically next door work hard to make for this special occasion? Why does it irritate me to see teens out in really lame costumes going door to door? I did it too…It eventually get boring. Why does it feel like they are stealing or taking advantage of people? Why is it bad to drive around with your kids to find a great place to trick or treat? Some kids don’t live in an area where the residences can afford the treats. There are probably a bunch more things that went through my mind, but it made me think, did my parents think all this crap when I was little? I will probably ask them one day. I am curious. Do we need to protect our kids so much? Maybe. I don’t really know. I just try to do my best with them. But I am inclined to think we are over protecting them. To their own detriment. I am sure the boys had a blast tonight. But I think we are losing the fun. And I think that over-protecting them is not preparing them for real life. I watched a video a few years back about this era of protecting our kids. Today, because of my racing mind, I remembered it, and thought I would re-post it for you. Here you go.